This comprehensive research companion examines the theory, practice and historical development of the principle of federalism from the ancient period to the contemporary world. 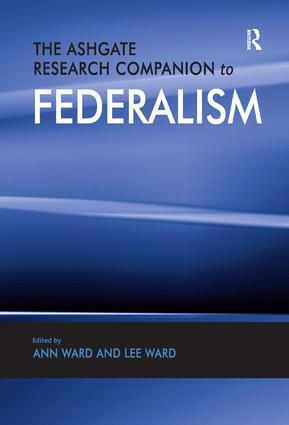 It provides a range of interpretations and integrates theoretical and practical aspects of federalism studies more fully than is usually the case. The volume identifies and examines nascent conceptions of the federal idea in ancient and medieval history and political thought before considering the roots of modern federalism in the ideas of a number of important European political theorists of the sixteenth through eighteenth centuries. The contributors focus on the development and institutionalization of the principle of federalism in the American Republic and examine the historical development and central policy debates surrounding European federalism. The final sections investigate contemporary debates about theories of federalism and regional experiences of federalism in a global context including Africa, India, Australia, the Middle East, and North and South America. The scope and range of this volume is unparalleled; it will provide the reader with a firm understanding of federalism as issues of federalism promise to play an ever more important role in shaping our world. Contents: Introduction to the volume, Ann Ward and Lee Ward; Part 1 Classical and Judeo-Christian Images of Federalism: Introduction to part 1; Nascent federalism and its limits in Ancient Greece: Herodotus and Thucydides, Ann Ward and Sara MacDonald; Before federalism? Thomas Aquinas, Jean Quidort and Nicolas Cusanus, Nicholas Aroney; The reformational legacy of theologico-political federalism, Shaun de Freitas and Andries Raath. Part 2 The Origins of Modern Federalism: Introduction to part 2; Johannes Althusius: between secular federalism and the religious state, Bettina Koch; Early Dutch and German federal theory: Spinoza, Hugo and Leibniz, Lee Ward; Montesquieu on federalism and the problem of liberty in the international system, Ann Ward and David S. Fott; Federalism and David Hume's perfect commonwealth, Will R.Jordan and Scott Yenor; Jean Jacques Rousseau and the case against (and for) federalism, Daniel E. Cullen; Kant and federalism, Joseph M. Knippenberg. Part 3 Federalism and the Early American Republic: Introduction to part 3; 'A system without a precedent': the federalism of the Federalist papers, Quentin Taylor; The anti-federalists and Tocqueville on federalism: lessons for today, David Lewis Schaefer; Thomas Jefferson's enlightenment idea of federalism, Peter McNamara; Tocqueville on federalism as an American accident, Peter Augustine Lawler; John C. Calhoun's federalism and its contemporary echoes, James Read; A more perfect union: secession, federalism and democracy in the words and actions of Lincoln, William Mathie. Part 4 European Federalism: Introduction to part 4; Confederation, federal state and federation: around Louis Le Fur, Guillaume Barrera; Looking into Medusa's eyes: Carl Schmitt on federalism, Nicolas Patrici; Alterio Spinelli and European federalism, Roberto Castaldi; Polyvalent federalism: Johannes Althusius to Edvard Kardelj and Titoism, Matthew McCullock; A 'European' federalism: from Alterio Spinelli to the EU Constitutional Treaty, Francesca Vassallo; From Laeken to Lisbon: Europe's experiment with constitutional federalism, Martyn de Bruyn. Part 5 Contemporary Theories of Federalism: Introduction to part 5; The covenant tradition of federalism: the pioneering studies of Daniel J. Elazar, Glenn A. Moots; William Riker's 'rationalist' federalism, Benjamin Kleinerman; Theories of fiscal federalism and the European experience, Alberto Majocchi; Postmodern federalism and sub-state nationalism, Greg Marchildon. Part 6 Regional Experiences of Federalism: Introduction to part 6; Federalism in Africa: an indigenous idea with a colonial history, Sara Jordan; Australian federalism: an innovation in constitutionalism, Haig Patapan; India: a model of cooperative federalism, Akhtar Majeed; Federalism: the Latin American experience, JuliÃ¡n Durazo Hermann; Federalism or Islam? Ibn Khaldun on Islam and politics, Khalil Habib; The Rehnquist court and the 'new federalism', Jack Wade Nowlin; Conclusion, Ann Ward and Lee Ward; Index. Dr Ann Ward is an Associate Professor in the Department of Philosophy & Classics and Political Science, Campion College at the University of Regina, Canada. Dr Lee Ward is an Associate Professor in the Department of Political Science, Campion College at the University of Regina, Canada. The end of the Cold War profoundly altered the dynamics between and within the various states in Europe and the rest of the World, resulting in a resurgence of interest in the concept of federalism. This shift in balance has been further fuelled by the increase in the number of conflicts arising from the disaffection of the diverse ethnic or religious minorities residing within these states (e.g. Sudan, Iraq). Globalization is forcing governments not only to work together, but also to reconsider their internal roles as guarantors of economic growth, with regions playing the major part. Federalism Studies offers academics a complete and in-depth understanding of federalism and intergovernmental relations in historical, theoretical and comparative contexts. Intended to be international and interdisciplinary in scope, the books in the series are designed to build a common framework for the constructive analysis of federalism. Contributions are welcome on topics which explore federalism as a theory; as a political system and as a form of conflict management.